There are some important milestones in life that once achieved transform one into a better person. A bachelor will change his philandering ways once he finds the right woman to settle down with. He becomes a family man and focuses on providing for them. This is always so inspiring because it teaches us to value the most important things in life. A family get-together, a corporate function to celebrate the company's achievements, a wedding anniversary, a birthday celebration or an engagement party all make you appreciate the beauty of life in a manner that you did not do before. When you are a DJ, you get the opportunity to play at some of these gigs. So far they have been a real eye-opener for me. People love great music and wonderful entertainment because that is what makes a party awesome. I try my best to keep the patrons entertained and help them have a good time. In my line of work, I meet so many new people, all with different life experiences and backgrounds. I get to meet people who challenge my thinking and in the process make me view things from a different perspective. You can't succeed in this life when you are close-minded or live in a cocoon. I have come to appreciate the diversity of mankind and had the pleasure of interacting with people from various cultures. I have learnt a lot from the people that I have spent time with during these special occasions. I get inspired by young people who found love against all odds and eventually took the bold step of walking down the aisle. Whenever I perform at a wedding party, I take the time to ask the newlyweds about their journey and how they knew that they were ready to take that step. The stories I've heard so far have made me believe in loyalty, commitment and speaking your mind to the person that you are in a relationship with. In an era where young people are so skeptical about love and commitment, these events have surely been an inspiration. Family get-togethers have made me realize the critical value that being in touch with your close relatives plays in your life. I have come to know that the most important things in life do not really have monetary values. It's always so good to see the loving embraces, listen to the hearty laughter and hear good-natured conversations. People waste so much time chasing after things that do not matter and ignore the ones that will stay even when they lose it all. These experiences have surely made me a better person. Being a DJ has also made it possible for me to meet some wonderful people in life who have transformed my life in a major way. Top executives at corporate functions have given me very good tips on how to grow my brand. They have also been very helpful in giving me referrals and this has seen my business grow. I must say that along the journey, I have met some new friends and created lasting relationships. I have truly grown as an entertainer and become a better version of myself. Most couples engage in heated debate on whether to hiring a DJ or band for the wedding ceremony, cocktail, or dinner. The pros surrounding DJ services express the reasons most event planners prefer event DJ over a band. For the past six years, the DJ market has grown tremendously. A simple laptop coupled with music, lighting, a sound system and expertise defines the DJ business outgrowth. A broad continuum of guests bearing different music taste attends a wedding. Other than the bride and the groom, the young and the old generation from various locations attend a wedding. With a DJ, rest assured that everyone will dance to a favorite tune. This is a very nice way of capturing the entertainment needs of various guests. From classics to modern, A DJ offers an endless variety of music. The ability to play Dolly Parton, Katy Perry and John Legend creates a terrific playlist that keeps the guests happy to the end. Thus, the capability to play an array of music than live music makes DJ services fashionable. A memorable wedding consumes a lot of money. However, the event planners try hard to minimize expenses. In that case, the DJ services are cost effective compared to a band. A typical band comprises of four or eight people against one guy or girl with a laptop. A great DJ can cost $ 1,000, while a grand wedding band demands several thousand dollars. Thus, the cost disparity is incredibly huge. If interested in a less pushy approach to a wedding, then a professional DJ is the way to go. Self-effacing DJ maintains stable excitement on the dance floor as well as channels the attention to the couple and their celebration or dance floor rather than the stage. Thus, a well-equipped and organized DJ efficiently addresses the unique needs of a wedding. With separate systems, the ceremony, cocktail hour and reception feature unique music. Most bands commonly perform at the reception only. The combination of a series of quality music characterized by reliable instruments and vocals sounds great at any level of volume. Thus, with a vast collection, the DJ keeps your guest dancing without any breaks. The DJ is also able to adjust quickly throughout the event based on the circumstance. On the contrary, bands are limited to the number of songs they best play. Most of them can do 15 to 30 songs at the reception. Very few bands can play a wide genre of music to meet the taste of guests based on age and location. Have you ever imagined a set of songs for your wedding, then, think of a DJ. He will play your favorite songs. A DJ will play the preferred processional music allowing the bridesmaids, flower girls, brides and her father to move down the aisle in style. Most people want to make their wedding day memorable. Thus, with a DJ, the prelude, pre-processional, processional, reception, cocktail and evening party will feature enticing music. With a wedding DJ, a wide range of music entertains your guests from the beginning to the end making the day memorable. Live wedding bands are becoming more and more popular at wedding parties lately in Arkansas. Almost everyone who's thinking about getting married generally seems to want a live wedding music band. Certainly, this is not surprising when you consider the many advantages that live wedding music bands will bring to a wedding reception. In comparison to music played by an ipod player or a professional DJ, a fantastic live party or wedding band adds a rather unique quality for the tunes that are performed. It can no doubt make the wedding celebration memorable for the ones getting married and to their reception guests. Live wedding bands are good to book but might take a lot of your energy to search for, which is especially true in the event you have had no working experience before. Listed here are things to consider any time you're searching for a live band for your wedding reception. Do some searching online. Search online and search by location. You will probably be astonished to see that there are lots of choices in your own town. Booking a live wedding band that lives in the same city as you will usually be helpful and saves money for the wedding bands travel expenses. Request an mp3 of the wedding bands performance. Check their website to determine if they have some music samples of what they play or videos of the wedding bands live shows. In this way, you'll be able to assess the quality of their musicianship and singing and how good they perform in front of a crowd. You may also see them perform live on stage if they have an event in your community. Ask around. Word of mouth are ordinarily a good way to obtain lower rates for live wedding bands. It's also possible to receive some good suggestions or ideas from other people who have booked bands previously. Any time you ask around you'll more than likely get suggestions flowing in from all directions. You'll just have to examine all the information, write down a list of options, and then begin looking at each band separately. Tell the wedding band about the details of your wedding reception. After you have decided on the perfect wedding band, then tell them about the things they should be aware of when it comes to the wedding reception. For instance, do you want the band to wear a certain attire? How late do you need the band to preform? Do you want the live band to preform during the marriage ceremony or just at the reception? Give a song list to your live wedding band weeks before the wedding day. If you can, let them have a list of music and songs you want them to perform several weeks before the wedding reception. By providing this list in ahead of time, the band will have enough time to rehearse themselves with the music. All it requires is just a little advanced planning and one of the many great live wedding bands around to make your very special occasion something memorable. Music and talent booking agents obtain work for musicians or acts. The booking agent negotiates when and where the band or artist will perform, as well as the compensation terms of the contract. Many music and talent booking agents operate on their own, while others work for talent agencies. Music booking agents schedule live performances for his or her purchasers. To do so, they have to network with venue operators, music promoters and other booking agents. They handle all money matters in connection with the date and coordinate the programming logistics. In states that need licensure, booking agents are restricted from acting managerial duties. Where they're less restricted, however, music booking agents may additionally be involved with promoting the events they book. 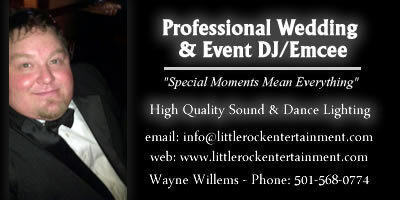 At Little Rock Entertainment Agency we provide a vast array of entertainers for all types of events. So, if you are planning a wedding reception, party, prom or corporate event we offer some of the best entertainers in Arkansas.